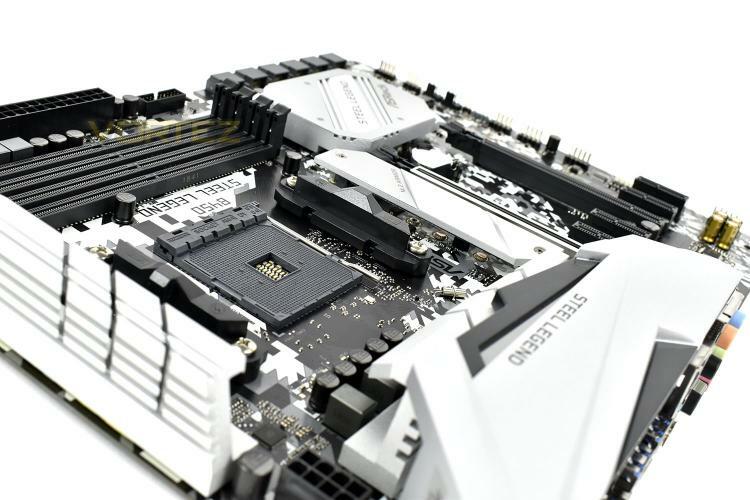 ASRock, established in 2002, specialise in the motherboards sector, providing customers seeking high overclocks and solid stability with high-end motherboards for both Intel and AMD chipsets, however, they also design boards for tighter budgets. Today we look at something sneaking under the £100 barrier while claiming to offer most of the frills you’d expect on something much more expensive. Here’s the ASRock B450 Steel Legend, an ATX form factor motherboard based around AMD’s B450 chipset. With the Steel Legend we get RGB lighting, on the rear IO shield and the Southbridge heatsink, a pair of M.2 slots, a black and white style with urban came printed onto the circuit board, full 7.1 audio and support for AMD CrossFire X. At £99, it’s not the cheapest B450 motherboard we’ve tested, but nor is it the most expensive. Let’s see where “middle of the road” gets us in terms of performance.